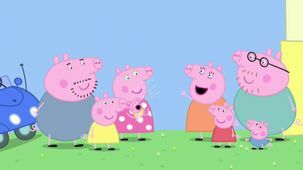 Peppa Pig is also available on Mini TFO A section just for the kids, without ads! Click to explore! 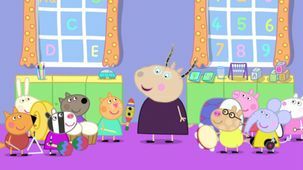 Peppa is a loveable, cheeky little piggy who lives with her little brother George, Mummy Pig and Daddy Pig. Peppa's favourite things include playing games, dressing up, days out and jumping in muddy puddles. Her adventures always end happily with loud snorts of laughter. 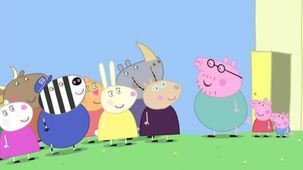 Grandpa Pig organises a chocolate egg hunt for Peppa and her friends. But the little children are sad when they can´t find any eggs, so Grandpa and Granny Pig show them that there are some chicks in the garden that are smaller even than them. 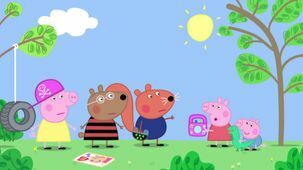 Peppa and George wake up one morning to find that all the rain has made a flood, and their house is now a desert island! 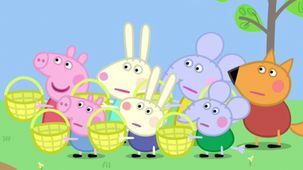 Peppa and her friends go to help at Edmond Elephant´s birthday party, but the little children are harder to look after than they´d thought. Some of Daddy Pig´s important work papers have gone missing...because Mummy Pig, Peppa and George have accidentally made them into paper aeroplanes. Mrs Zebra teaches Peppa, George, Zoe, Zaza & Zuzu Zebra how to make a real tea set from clay. 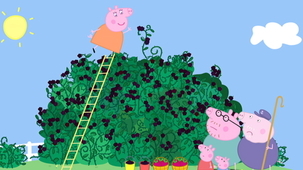 Peppa and her family collect apples and blackberries in Granny and Grandpa Pig´s garden to make a pie. Madame Gazelle takes the children to Grampy Rabbit´s gym class, where they learn how to be real explorers! 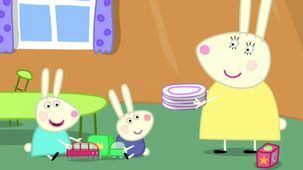 Peppa and George go to play with Cousin Chloe and her friends, but the older children don´t want to play any "baby" games. Mr Fox takes Freddy to Peppa´s house for a bike ride with the other children, and they all try to guess what kind of things Mr Fox has in the back of his van! Peppa tries to prove to Suzy Sheep that she is not a chatterbox, but staying quiet is harder than it sounds. Daddy Pig loses his title as Champion Puddle Jumper, until everyone helps him train to win it back. Madame Gazelle brings lots of musical instruments into playgroup for the children - instruments that go "shake", "rattle" and "bang!" 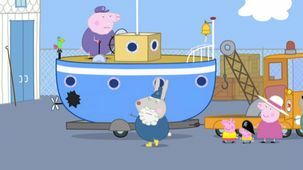 Grandpa Pig needs help when his boat sinks, so Granddad Dog gives them all a lift to Grampy Rabbit´s Boatyard so that the boat can be fixed. Suzy and Peppa start a Secret Club - going on secret missions, and doing secret things. In secret. But soon everyone wants to join! Grandpa Pig takes Peppa, George and Danny Dog to visit Grampy Rabbit´s lighthouse. It is Christmas and the children all visit Santa´s Grotto to tell him what they would like for Christmas. Miss Rabbit has hurt her ankle, so her sister Mummy Rabbit, and the other adults, offer to fill in for Miss Rabbit at the ice cream stand, the supermarket, and everywhere else she works! 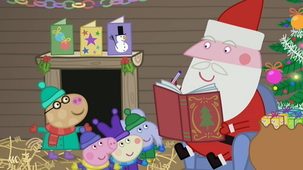 Peppa is worried when Santa brings everyone but her a present, but he soon returns to deliver her missing present in person. 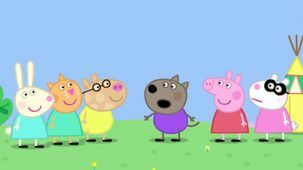 Peppa´s cousins come to visit, but baby Alexander is too young to talk, until Peppa teaches him his first word. 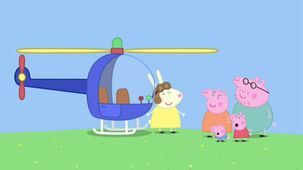 Miss Rabbit takes Peppa and her family for a ride in her Rescue Helicopter! 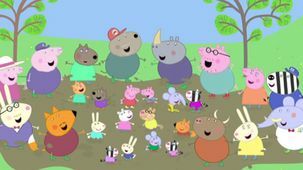 Peppa and her friends at playgroup go with Madame Gazelle to visit Pedro Pony, who is in hospital. Mummy Pig gives Granny and Grandpa Pig her old computer to work, and play on. 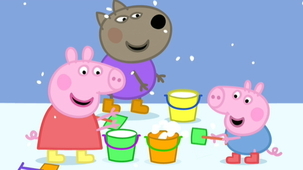 Peppa and her friends and family are looking forward to a trip to the seaside where they can make sandcastles, but when they arrive at the beach there´s too much snow! Doctor Hamster the vet comes to Peppa´s playgroup to show the children her pets.